If you follow mid-major college basketball, you know that Long Beach State has been getting a lot of publicity following their victory over Pittsburgh last week. They are 8th in the Mid-Major Top 25, for instance. Another place that they are getting publicity is on CBS Sports, the premier college basketball blog on the web, who talked Tuesday about how the 49ers are going to be coming up on a tough stretch. Long Beach got Pittsburgh in the Peterson Events Center last week. One more could put the 49ers in position for an at-large bid -- pending they roll through the Big West, but don't win the league tourney. 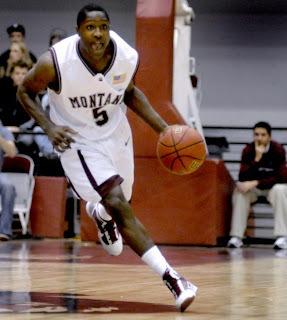 Next up is Boise State at home, tonight, then a road contest at Montana -- before The Stretch. It starts at Louisville on Nov. 28. Then comes BYU, followed by trips to Kansas (12-6) and North Carolina (12-10) before opening with Xavier on Dec. 22 in the Diamond Head Classic. I can only assume that LBSU is not taking a trip to Montana as lightly as a lot of other people are, because Montana absolutely can beat them. Will Cherry will make it his goal to put the lockdown on Casper Ware, and the offense will be looking a bit better with Derek Selvig back and healthier. The Grizzlies should be well aware of what a win like this would mean, because LBSU is a very talented team that seems like it will be in the mix for a Tourney berth. This game could be a nice boost for Montana's resume and national profile, in large part because LBSU has a lot of hype surrounding them early on this season. If you just look at the schedule, Long Beach State at Montana at Saturday is not one of the biggest games of the day, and it doesn't necessarily jump out at you, but it is surely one of the best opportunities the Big Sky has for a marquee win, and should be a really exciting game. All Big Sky fans should be rooting for Montana on Saturday, because it will be a great chance to earn some respect nation-wide.